The term 'batter head' is used in different ways. It may be used to describe any drumhead that has a coated surface. Alternatively, it may be used to refer to the 'playing' side of a drum, in which case it is most commonly applied to top head of a snare drum because the bottom head on the snare, being very thin would quickly break if it was repeatedly struck. 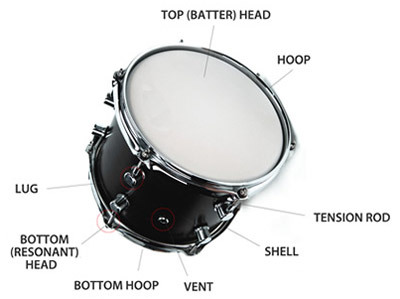 For all drums other than a snare a batter head may be on the top and bottom although they can be a different type and/or thickness to change the ambient sound of the drum. The bottom is also referred to as the resonant head.